This jar, of classic form, is painted in black and orange over a creamy buff-colored slip, with friezes of geometric, stepped and hatched designs within multiple triangles. The base is concave. 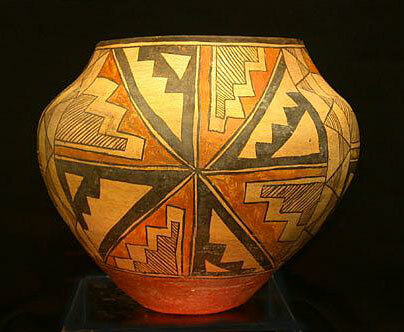 Unknown Acoma Pueblo artist of the beginning of the 20th Century. According to the previous owner, this jar was originally found in an outdoors shelter along with another jar of similar vintage. They were partially covered with a chalky substance, and when removed, showed much evidence of native usage. Condition: At one time, the surface of this jar was partially covered in a chalky substance, most of which has been cleaned, though there are faint remains. There is some fading to the paint in one area where cleaned. There is some minor restoration around the rim edge, as is common for native well-used pots. There are a few minor abrasions around the base. This jar is in otherwise fine condition.